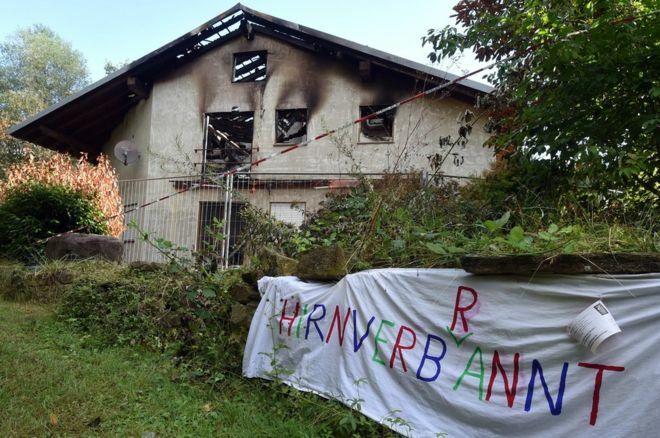 The German government says there have been almost 500 attacks on homes intended for asylum seekers this year – three times more than in 2014.German Interior Minister Thomas de Maiziere called such violence “shameful”. Two-thirds of the attacks were carried out by locals who had no previous criminal record, he said. Germany expects to host at least 800,000 asylum seekers this year. Bavaria’s leaders have demanded that Berlin restrict the numbers arriving. The southern state’s conservative CSU government opposes Chancellor Angela Merkel’s open-door policy for refugees. Yet formally the CSU is allied with her Christian Democrats (CDU). Many of the migrants reaching central Europe via the Balkans have expressed a wish to settle in Germany. Germans are split over Ms Merkel’s welcome for refugees from Syria, Iraq and other conflict zones. That welcome does not extend to non-EU economic migrants. Mr de Maiziere called for tough action against those who attacked asylum seekers. Some attacks were on empty buildings, but others targeted hostels already occupied by migrants. Those responsible “must be made to understand that they are committing unacceptable offences: assault, attempted murder, arson,” he said. In a statement on Friday the Bavarian government threatened to go to the German Constitutional Court to compel the federal government to impose a cap on asylum seekers. Bavaria received 241,000 migrants between 1 September and 5 October, of whom 86,000 were sent on to other German regions, the Munich authorities said. Speaking at a news conference, Bavarian state premier Horst Seehofer said “we need to restrict immigration in order to maintain the public’s solidarity with those in need of protection”. He also said a cap on the numbers was necessary “to guarantee our domestic security”. He said the influx was not posing a terrorism threat, but “it’s a question of criminality in the broadest sense”. Next year Bavaria plans to appoint more than 3,700 extra public service staff to handle the crisis. Mr Seehofer’s deputy Ilse Aigner said Germany could expect as many as seven million refugees, because of relatives legally joining those granted asylum in Germany. Mr Seehofer said Bavaria should have the right to refuse entry to migrants at its border with Austria. However, the federal – not Bavarian – police are responsible for border controls.